Founded in 2013 by a European-Mexican couple, Concepto Arena Blanca propose you wonderful holidays in Tulum Mexico. We are currently managing condos, apartments and beach houses that can be rented anytime. Contact us if you are looking for a beautiful place in the Riviera Maya. This condo is ideally located close to the beautiful beaches of Tulum and is only a short bike ride or walk into town. We often ride our bikes to the beach, park by Mezzanine and then walk the beach to the beach club. We find the Tulum beaches the nicest of any of the beaches we have visited including Costa Rica and Jamaica. The condo itself has become our home away from home in the winter. For the past three years we have called this beautiful condo home for the months of January and February. We love the bright, fresh and clean look of the condo as well as the wooden furniture made from local craftsmen. The condo is well maintained and very comfortable. The kitchen is well stocked and has everything we need to make a home cooked meal. With the large supermarket, Chadraui, just 5 minutes away, it’s not hard to cook a gourmet meal when we prefer to eat in. With two bedrooms and two bathrooms, we have enjoyed having family members and friends come for short visits. We enjoy the upstairs terrace with the hammocks and loungers. It is always nice to watch the sunset while tending to supper cooking on the grill. The hottub came in handy when our grandchildren came to stay. We put some cool water in and the adults and children alike enjoyed cooling off in it. The terrace is a lovely, quiet, little oasis for reading, relaxing and having that pre-dinner cocktail or nap. The owners, Rosy and Phillipe, have gone out of their way to make our stays with them comfortable and enjoyable. We like that they are near by and they are always willing to assist in any way they can. 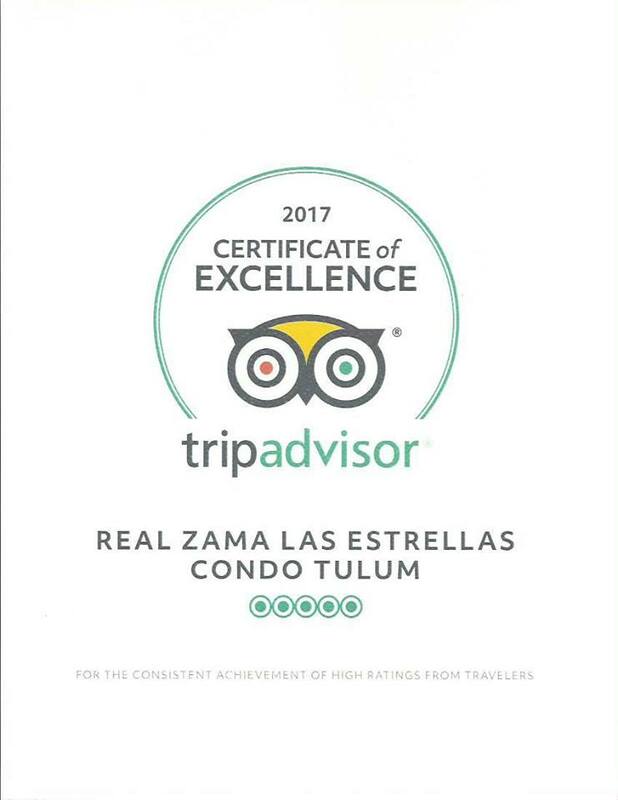 We truly feel safe and at home when we are at “Las Estrellas”. We also like the friendly and quiet atmosphere of the pool area. We especially used the pool this past year for daily laps as well as visiting with friends while enjoying the afternoon sun. The garden is well tended and it’s interesting to watch the many birds that come to perch in the trees and check out the blossoms. We enjoy watching the orioles, hummingbirds, chachalacas and many other birds that frequent the tree tops close to our balcony each day. And it’s always nice to hear their songs as we wake up each morning! I guess the fact that we keep going back year after year speaks for itself. I can’t imagine going anywhere else! Staying at Aldea Zama, Condo "Las estrellas"
It’s a very quiet place, perfect for vacations. The apartment is huge and and nicely furnished. The climatization works really well, which is crucial in summer. The swimming pool is definitely a big plus and always pleasent after an incredible day at the beach. Staying a Aldea Zama, Condo "Las estrellas"
This condo is beautiful! It has a lot of space and amazing details in the bathrooms, the terrace and the jacuzzi on the terrace. We loved the pool, and the service was great. They helped us locate all the interesting things to see in Tulum. Plus, it’s close to the beach and to the main street where you can find cool bars and restaurants. We’ll definitely visit again! My husband, kids and nanny visited Tulum in January 2016 for work. But our “work” vacation quickly turned into a fun and exciting trip. We arrived in Tulum exhausted from our flight and getting through customs and were immediately greeted by the kindest, sweetest person in all of Tulum- Rosalina. She showed us to our rental and we were amazed at the gorgeous place she provided for us to stay in and for such an amazing deal. She took the time to tell us everything we needed to know about the place and about the town. I was blown away at how gorgeous the condo was! And AC! Whew! This condo is perfectly situated in between town and the beach. The rental in Aldea Zama was everything we had hoped it would be! We loved it so much, it helped us decide where we would like to purchase our new home. If you are staying in Tulum this is the perfect place and area. The condo is beautiful and private which was perfect for the 6 of us. Rosy suggested places that really made our trip amazing and visiting mexico for the first time she made it comfortable. It was like having a friend and tour guide all in one! The market is right down the road along with a 7 11 with an atm. The condo was beautiful, cleaned and perfect for a stay in Tulum. I also had a great time thanks to Rosy and Philippe. They shared with me a lot of tips on how to explore the fascinating Riviera Maya.